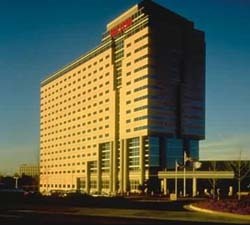 Whether You Are Traveling On Business Or For Pleasure- The Award-winning Hilton Atlanta Airport Is The Perfect Stopover. Conveniently Located Just Minutes From Hartsfeld International Airport- The Hotel Is Only Eight Minutes From Atlanta's Central Business District. Shuttle Service Is Provided To And From The Airport Or To The Marta Station. The Four-diamond Hotel Features Fine Accommodations And Thoroughly Professional Service Combined With A Warm And Inviting Atmosphere. A Four Million Dollar Renovation Of All Public Areas And Meeting Space Will Be Completed In 2002. All Guest Rooms Are Newly Renovated And Have Triple Paned Windows So That Airplane Noise Is Reduced To Virtually None. For Guests Demanding The Maximum In Comfort And Privacy- The Towers Level Provides Seperate Registration- A Concierge And Access To The Towers Lounge Which Serves Complimentary Continental Breakfast And Evening Hors D*Oeuvres. The Hotel's Central Location Means That You Can Reach Your Destination Quickly And Easily Whether You Are Visiting The Central Business District- The State Capital- Zoo Atlanta- Stone Mountain- Six Flags Over Georgia- The Georgia World Congres Center- Underground Atlanta- Turner Field- Buckhead- The World Of Coca Cola Or Others. When Guests Return To The Hotel They Can Enjoy Our State-of-the-art Fitness Facility- Our Indoor And Outdoor Pools- Our Jacuzzi- A Meal In One Of Three Restaurants- Or A Relaxing Evening In Our Two Lounges. From The Moment You Enter The Hilton Atlanta Airport And Are Greeted With Warm Southern Hospitality You Will Know- It Happens At The Hilton.